Please refer to our stock # 705 when inquiring. Original Antique 19th century Italian oil painting on canvas. 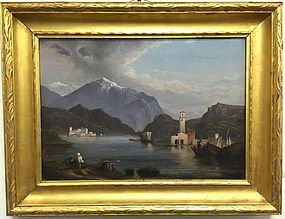 Titled "Lake Como" and initialed SPH. lower right. Canvas 14"L x 20"W. Overall framed size 20" L x 26" W.